Derek Pruitt - dpruitt@poststar.com Shoppers walk past the papered windows of the former Old Navy storefront at Aviation Mall in Queensbury on Thursday, Feb. 11, 2010. The space is being taken over by Party Palace owner John Myers who will move from his current location in the mall to get more space and better mall frontage. Myers said economic downturns gives smaller retailers like himself more opportunity to expand. Derek Pruitt - dpruitt@poststar.com The former Old Navy space sits vacant as Party Palace owner John Myers makes preparations to move into the new location at Aviation Mall in Queensbury on Thursday, Feb. 11, 2010. Myers said economic downturns gives smaller retailers like himself more opportunity to expand. Myers expects to be open by the end of the month at the new location. Derek Pruitt - dpruitt@poststar.com Shauna Palmer helps her son Carter down from a thrown chair while playing with Mindell Vanderwarker and her daughter Olivia (background) at the Party Palace at the Aviation Mall in Queensbury on Thursday, Feb. 11, 2010. With the exit of the Old Navy store, Party Palace owner John Myers is moving his business to the larger space with more mall frontage. Myers said economic downturns give smaller retailers like himself more opportunity to expand. QUEENSBURY -- When Old Navy left Aviation Mall last month, small-business owner John Myers saw an opportunity. Myers runs a family fun center called Party Palace at the other end of the mall, and with business going well, he negotiated a move to the 18,000-square-foot vacancy. If it weren't for the recession and a major retail slump, Myers said he wouldn't have bothered asking. "When the economy is bad, that gives an entrepreneur the opportunity to come in and try something," he said. "Corporate (chains) aren't building, so the little guys have a chance to get the right deal." With mall vacancy rates at record highs nationwide and few chain stores expanding, non-traditional and independent businesses can be a way for shopping centers to fill the gap, retail experts say. Reis Inc., a real estate research firm, said the U.S. mall vacancy rate was 8.8 percent in the fourth quarter of 2009 - the highest it has been since Reis began tracking regional malls in 2000. Santa Monica-based Macerich Co., which owns Wilton Mall, reported 9 percent vacancy as of Dec. 31, 2009, up from 7.7 percent in 2008. Meanwhile, tenant sales per square foot fell from $441 per square foot in 2008 to $407 in 2009. The Pyramid Cos., which owns Aviation Mall, is a privately held company and is not required to report its occupancy. Mall Manager Terri Walsh declined to offer numbers, but said Pyramid, and Aviation in particular, have done well. Still, there have been some high-profile departures, beginning with the closure of Steve & Barry's around the 2008 holiday season due to bankruptcy. In recent months, Old Navy, Pacific Sunwear, Play N Trade, the seasonal Adirondack Phantoms team store, a seasonal gift shop and a pizza eatery shut down. The former Old Navy store is the largest vacancy at the moment. Party Palace will take over that space in March, but the relocation could leave its current 15,000-square-foot digs empty. Of the new stores to come to the mall in the last year, many have been owner-operated businesses such as Party Palace, a sports memorabilia store and a newsstand. 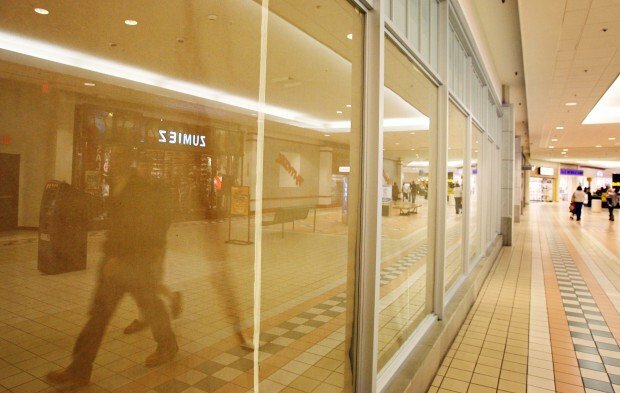 At least two other vacancies are partially occupied with window displays, which serve as advertisements for the Wood Carte in Queensbury and another for Maurices, a clothing store located elsewhere in the mall. According to the International Council of Shopping Centers, the downturn in retail has forced a lot of malls to fill spaces creatively. "We're seeing a lot of centers losing their national tenants, and they do need to get those spaces filled," said Erin Hershkowitz, spokeswoman for the council. She noted that some malls have brought in day care businesses, skating rinks, art galleries, and independent stores. Hershkowitz said the leases are usually temporary and serve as a way to keep vacancy rates lower. The council reported a 2 percent increase in holiday sales, and says some retailers are starting to expand - good signs that 2010 will not be as tough as 2009. "We're really expecting vacancy rates to improve by the middle of the year," Hershkowitz said. Retail consultant Howard Davidowitz, chairman of Davidowitz & Associates Inc. in Manhattan , was less optimistic. He said unemployment has not subsided, no new enclosed malls are under construction, and shopping center vacancies are at all-time highs. Shopping centers have looked to non-traditional tenants such as medical facilities, churches and car dealerships as a stopgap measure during desperate times, Davidowitz said, but it's not a good sign of things to come. Small, independent stores tend to be a higher credit risk, they pay less in rent than chain stores, and they don't have the purchasing power to offer the fashion content or prices that generate mall traffic, he said. "It's a sign of desperation," he said. "It all is a big sign of weakness, and in the end, more malls are going to get closed (nationwide)." Brian Florence of Glens Falls, who has run the Web site www.deadmalls.com for the last 10 years, agreed. He said a "dead mall" has a high vacancy rate and an odd mix of tenants, and for those reasons Aviation has been placed on his list. "A mall is a store that sells stores, and you have to have a product line that attracts people," Florence said. While attracting a big-name store like Best Buy would seem like an easy solution, Florence said many big-box retailers are finding more success in standalone locations or plazas. He cited the transformation of Clifton Park Center, which was partially demolished as a traditional mall in 2006 to create a plaza feel and give more stores street access. For her part, Walsh said national retailers continue to choose Aviation Mall. Foot Locker opened last year. Verizon will soon move from a kiosk to an empty space next to Auntie Anne's Pretzels, and negotiations are under way with another business she declined to name. Walsh said Pyramid has always tried to be an incubator for small businesses, and that the mall has a place for national chains and local shops. She said there are always closures at the beginning of the year in retail, and the changes at Aviation Mall are more cyclical than a reflection of the economy. As for Myers, he said birthday party bookings at Party Palace have been strong on the weekends, and the move to a larger space will allow him to bring in new attractions and hire four new part-time workers. 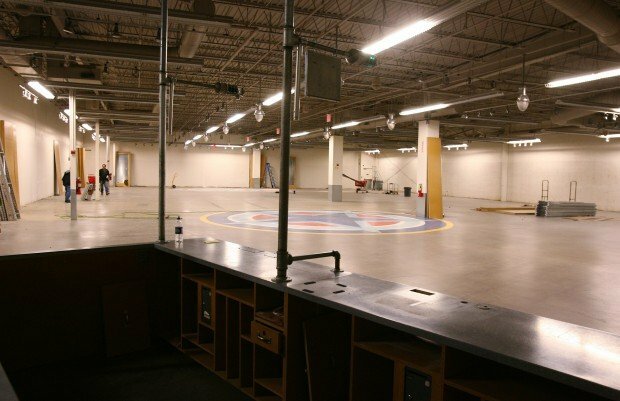 Myers, who also runs a gift shop at the mall and party rental business Entertainment One, said the mall was great to work with, and he understands that he might not be able to hold onto the former Old Navy space once his year lease is up. "You play the game and you live by the mall's rules," he said. "A company could come in and want that space, and you are gone."